Beautifully located five bedroom, three bath cottage with incredible water views. A great home-base for your vacation adventures! 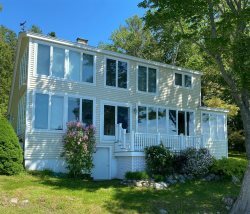 Welcome to Piffi Biff, a beautiful cottage located on the historic Southport Island on the Boothbay peninsula. With incredible views of the Atlantic Ocean, Squirrel Island, Boothbay Harbor, Burnt Island, you will also see porpoises, whales, migratory shorebirds, sailboats, yachts and lobster boats! The endless parade of nature- made and man-made oceanic wildlife and vessels will provide endless entertainment! Want to get in the picture too? Need more room? Right next door is Pine Cliff Dweller, a 2 bedroom, 2 bathroom cottage with a private dock and float. Both cottages can be rented together, making a perfect setting for a reunion, girls get-a-way or extended family vacation! Bring your own kayaks or rent locally. Launch from the association's dock and float just a short walk from your cottage. Piffi Biff is a great home-base for your ocean adventures! Don't sit home and "pine" for Maine. Piffi Biff is located in the Pine Cliff section of Southport Island, only a couple of miles from Boothbay Harbor. This is a perfect spot to see some of the schooners go by during Windjammer Days in Boothbay Harbor! Rent or bring your own bikes and explore this quaint little island, bike over to Southport Beach, enjoy lunch from the Southport General Store or Sunday Brunch at Newagen Seaside Inn. Don’t forget your camera as you explore this little slice of heaven! Experience Maine like a native. Visit our local farmers market, farms stands and farms to buy local and buy fresh. Don't forget the seafood. Lobster abounds in this area and can be purchased just a short distance away at Robinson's Wharf. THE HOUSE: Gorgeous views of the ocean are the hallmark of this classic Maine summer cottage. The main floor offers a large living room with a field-stone fireplace to be enjoyed by all along with the incredible views! A dining room and breakfast room offer even more visual delights. A covered open deck offers another dining area, as well as a place to just sit and take it all in, sights, smells and sounds. There is also one bedroom with a single bed, a half bath and a master bedroom with a Queen Bed and en-suite ¾ (shower) bathroom on this level. The Second Floor has two bedrooms, each with a King bed and the third bedroom with three single beds. There is also a full bathroom with a stand-up shower and a separate soaking tub. 1st Floor: One bedroom with a Single Bed. One bedroom with a Queen Bed. 2nd Floor: One bedroom with a King bed overlooking the ocean, Second bedroom with a King Bed. A bedroom with three single beds. 2nd Floor: Newly updated and renovated full bathroom with a shower and separate soaking tub. PETS PERMITTED? Yes, pets are allowed. LINENS & TOWELS INCLUDED? Yes, linens and towels are included at no additional cost. The Boothbay Peninsula is a beautiful region rich in culture, history, all things nautical and of course its own unique niche in nature. The area offers ample opportunities for biking, kayaking, canoeing, fishing, charters and guided cruises, spas, golf, mini-golf, bowling, museums, antiquing, hiking and walking trails. We have the Maine State Aquarium, the Coastal Maine Botanical Gardens and the Boothbay Region Land Trust with its 30+ miles of pet-friendly trails in protected areas. For a more comprehensive list of local offerings Click Here! Southport Island is a hidden treasure on the Boothbay Peninsula. Two miles from Boothbay Harbor, you cross the bridge onto the island and feel the world change around you. You know you are on vacation. Small sandy beaches, large expanses of rocky shoreline, views of Islands and open ocean, walking, kayaking, fishing and more! This quaint and historical part of Maine is treasured by the few who know of it! From the shore, you can see Cape Island once owned by Margaret Hamilton who played the Wicked Witch of the West in the Wizard of Oz. A pair of Ruby Red Slippers is on display at the Island’s library. Hendricks Head Lighthouse and Beach are just a short ride away for those who prefer swimming on more of a sandy beach. Rachel Carson frequented Southport often and mentions the area in her books. The Cuckolds Lighthouse can be seen just off-shore. This small little spit of land is rich in history, marine life, unique ecology and more. You will come back again and again! Can be rented in conjunction with Pine Cliff Dweller! In order to get what you really want from your rental, a conversation with somebody "in the know" is essential. Cottage Connection staff members were all very helpful in narrowing down our choices. Piffi Biff provided a good combination of the items we were looking for: pet-friendly, handicap friendly, and (our preference) and oceanfront property. Cottage Connection is very reliable and professional. We book with them to avoid problems and surprises! Piffi Biffs views makes for a wonderful experience. The spacious accommodations, the great and spacious deck! Driving Directions & Lock Box Code will be sent to the guest, via e-mail, TWO WEEKS prior to their scheduled arrival date. Swimming Area Rating 0/5: Piffi Biff does have use of the Association Dock & Float, just a short walk from the home. It is right on the water, but you do not have water access from the home. Privacy Rating 2/5: Semi-quiet location, neighbors close by. Bathroom Type: (1) Half Bathroom, (1) 3/4 en-suite bathroom with shower, (1) Full Bathroom with Shower and separate soaking tub. We represent a wide variety of quality vacation rentals throughout the Mid Coast Region of Maine. Individually and privately owned, each vacation rental reflects the taste of its property owners. Every effort has been made to ensure that the descriptions and amenities listed above are accurate. However, occasionally changes are made to furnishings, amenities, and equipment by the owners. Once a change is brought to our attention, we update the webpage. If you have any specific questions not addressed above or are in search of specific criteria, please contact us.